A few months back I received this tweet. 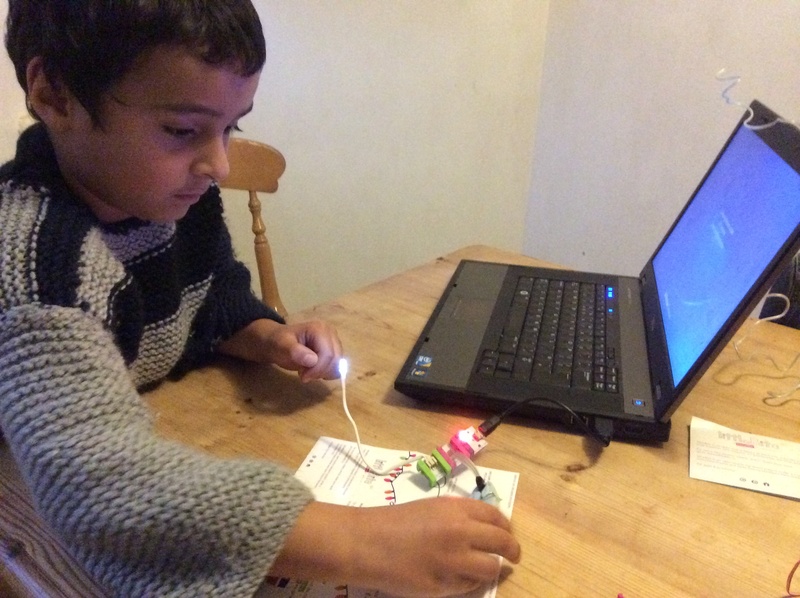 @coding2learn We loved your recent article about kids & computers & want to send you some Bits. Can you DM your email address? About a month later I was at home when the doorbell rang and a delivery driver handed over a parcel for me. I opened it up and was surprised to find three littleBits kits. Now I'd just (literally that week) started teaching a new subject called Systems & Control, that has a heavy element of electronics involved, so I packed the kits into my car and took them to school the following day. For those that don't know, littleBits make electronics kits consisting of snap together magnetic modules. 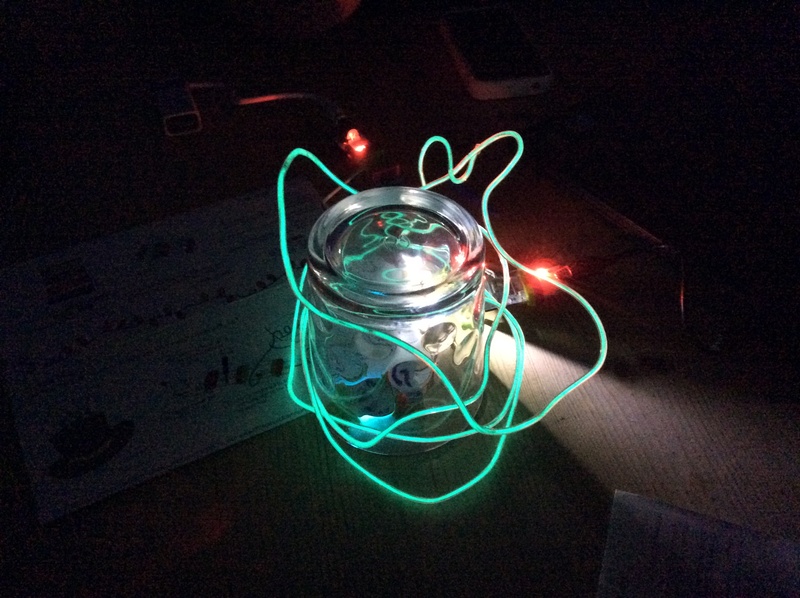 You can use the kits to make a range of electronic circuits - driving motors and buzzers and blinking LEDs. My colleagues and I stood around the opened boxes, picking up the little plastic modules, snapping them together and building an array of little projects. After fifteen minutes or so we all came to the same conclusion. The kits were clever, easy to use, accessible for students but completely impractical for a classroom of thirty secondary school students. The kits were placed back in their boxes, and left in a cupboard, forgotten about. Then, due to personal circumstances, my six year old son, Jimi, had to be home schooled by his grandmother. I remembered the kits in my classroom cupboard and took them over to her, suggesting she might like to put together some of the kits with him. This she did, dutifully following the instructions and assembling the kits. She reported back that they had built the circuits, and then the kits came home, to be once again forgotten about, this time in a drawer in Jimi's bedroom. On Saturday I was standing in the kitchen, enjoying a steaming cup of coffee and my morning Nicotine Replacement Therapy Lozenge, while perusing Hacker News. Jimi came bounding in. "Dad, come and look at the machine I've made." I've been caught out by this one before. The "machine" is normally a cardboard box with a cushion inside it and a pencil stabbed through the side. Sometimes it's supposed to be a rocket, sometimes a train or sometimes an Angry Birds catapult. "Why don't you bring it through here?" I asked, reluctant to leave my coffee and laptop. "It's a bit delicate," he said "but okay." He came in a few minutes later, but I wasn't really paying much attention as he began messing around on the kitchen floor. I looked over and was stunned by what I saw. Jimi had pulled out the littleBits kits and had assembled a monstrous creation. I got down on the floor with him and asked him what he had made. He explained the contraption. How you had to turn this thing and push that thing and hold down this part and then this part lights up and this thing makes a noise. He didn't use a single punctuation mark in his excitable and breathless sentence. We moved his machine onto the kitchen table and his big sister suddenly made an appearance. Within minutes the two of them were busily clicking together bits of electronics, having fun, amazing themselves, and more importantly learning. Jimi figured out that a push-to-make switch needs to come between a power supply and an LED to have an effect. He learned what a variable resistor does in series with a motor. He learned what a piezoelectric sensor does when combined with a buzzer. Obviously he learned none of the terminology, but that wasn't important. 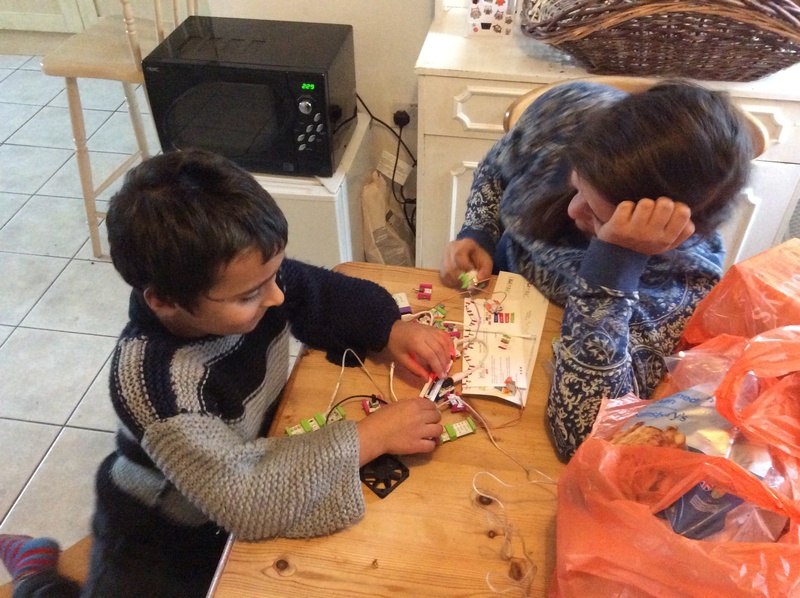 I'd dismissed the littleBits kits because I have preconceived ideas of what education should be. These misconceptions have been honed by years of operating in a pressured school environment, where results rule above all else, and where you're required to demonstrate progress in every lesson, term, year and key stage. Watching my son experiment, succeed and learn, all while having fun was sobering. Unfortunately the lesson I learned is one that I will struggle to apply in my professional life. There just isn't the time available to allow students to experiment at their own pace. I would love nothing more than to give the students the tools they require, be that in computing or in electronics, and allow them to explore the possibilities available to them, but alas I operate in a system where data rules and demonstrable progress is required. There are areas in which I can allow students to experiment. Thanks to a particularly keen and talented student, I have become involved with a project called THINKSPACE. This involves giving students a time and place that they can come and begin to develop apps. They work on what they want to, at a pace that suits them and where I am a facilitator and troubleshooter as opposed to a driver of progress. I can spare only an hour a week to THINKSPACE. It deserves two or three hours a day. I admire littleBits, THINKSPACE and similar initiatives. I think they're admirable endeavors with the right mindset when it comes to education. I just wish that policy makers within the education system shared their ideals and attitude towards learning, so that we could give all our students the opportunity to truly experiment in the classroom, to succeed and to fail, to have fun and most importantly to teach themselves to learn.